My iPhone is many things: lust object, trusty companion, second brain, alarm clock, pedometer … sometimes I even make phone calls on it. So, I feel guilty complaining about its simple need to be charged, or more precisely, its charge cord; I hate seeing it. 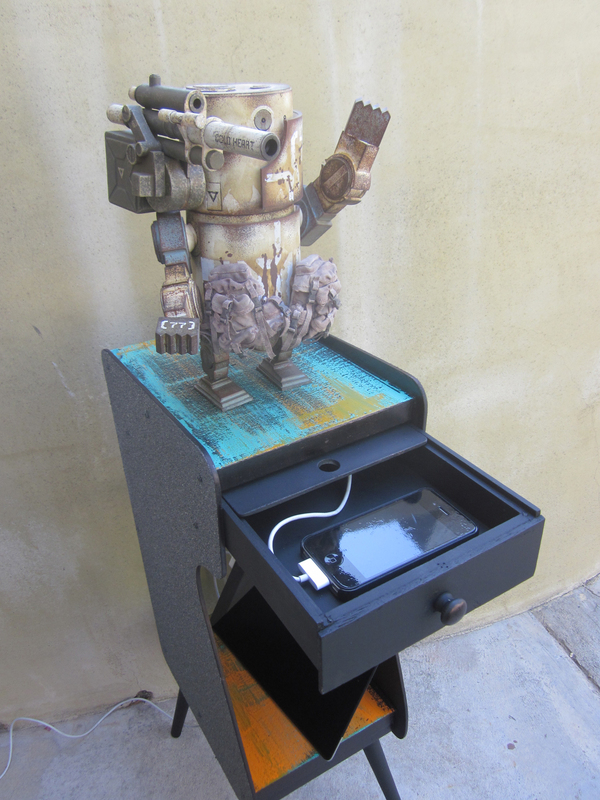 I’ve seen charging stations for iPhones, and they’re fine. I just didn’t relish the idea of spending money on another thing for the house. Surely, I thought, I could come up with something that would look good during re-juicing sessions, using something I already had. A quick scan around the garage and I found my solution; that’s it above. Not only good-looking, it’s a wry update of a telephone accessory from that bygone era when a smart phone was one that had a 20-foot long curly cord — you know, the 1960s. 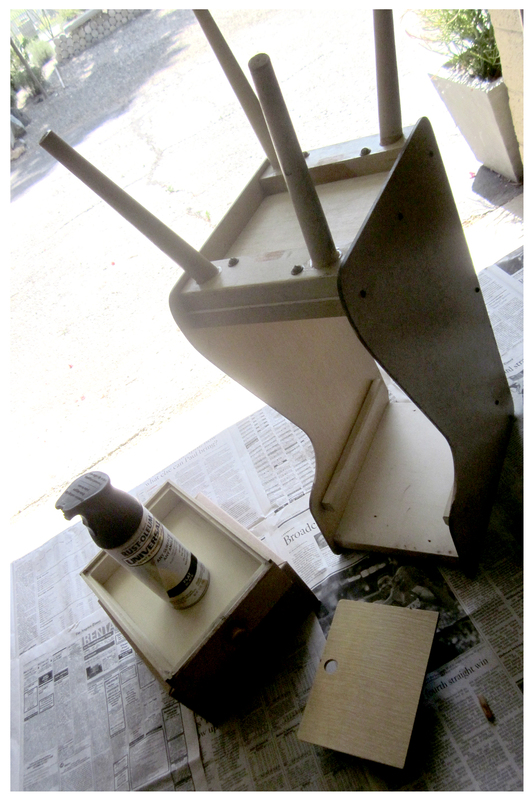 As with most old furniture revamps, the piece had to be cleaned thoroughly and repaired … some all-purpose spray cleanser, a screwdriver and wood glue took care of that (one leg needed re-gluing and the side screws were tightened). 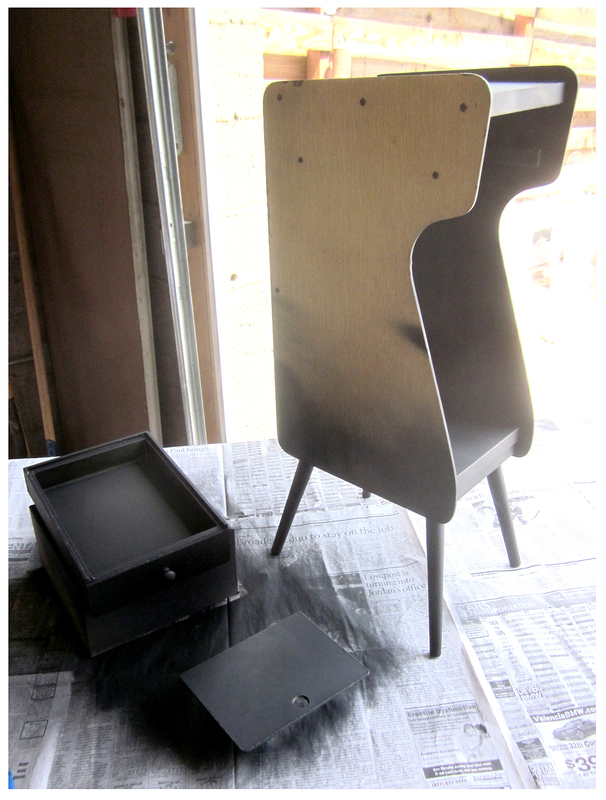 I decided to paint most of the table a matte black, and settled on a Rust-oleum any-surface-any-angle spray paint (spray paints used for this project were purchased at a big box hardware store). 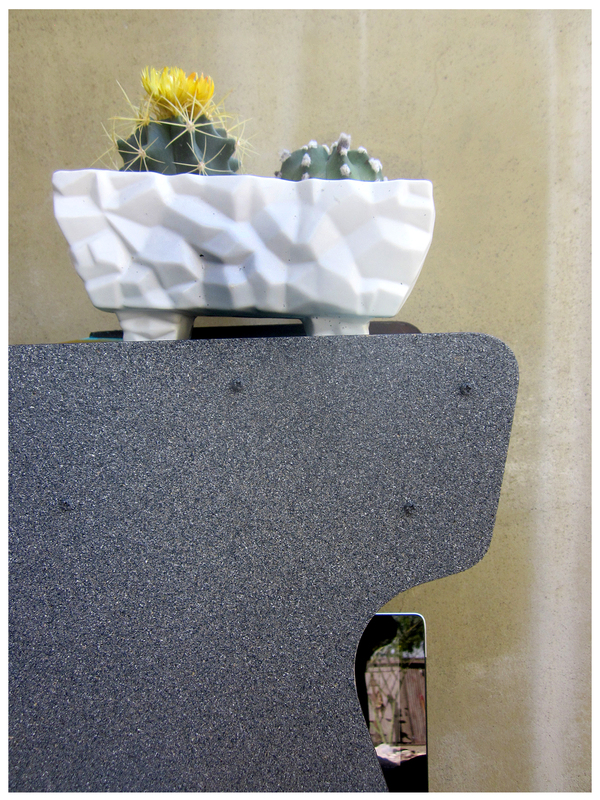 For the sides I chose a contrasting color, a textured stone gray spray paint by Valspar. As with the black paint this one is suitable for virtually any surface; once dry, however, it’s tactile, and feels like sand, with a subtle almost-glittery finish. To protect the black-painted surfaces I used painter’s tape as a mask all ’round the piece. 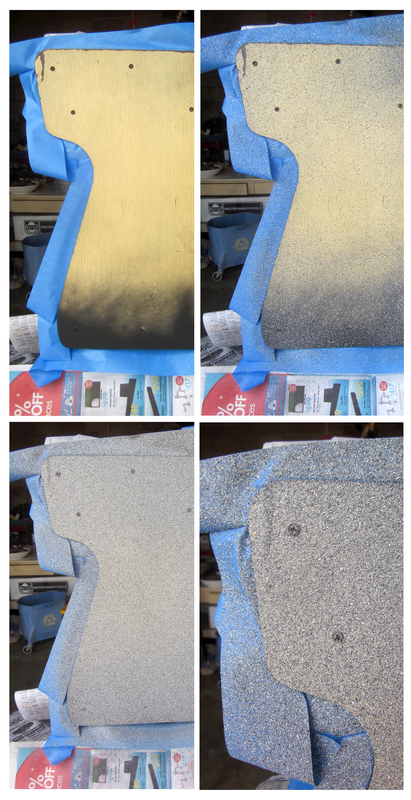 After spraying on several light, overlapping coats per side, I was satisfied with coverage. An hour later, and the piece was dry. I tidied up the colorful edges with black paint, then gave them a quick spritz with a matte fixative for protection … Now I couldn’t wait to give my new charger a go … only one crucial step to go! 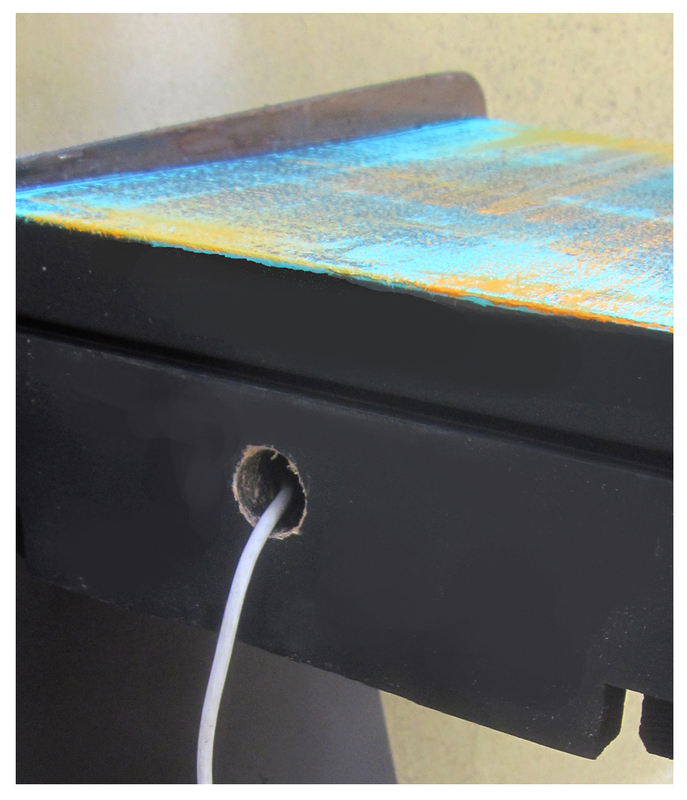 The back of the message-taking drawer needed drilling to accommodate the iPhone charge cord. The Rancho’s on-site power tool expert, Paul, quickly accomplished this; threaded, the cord now fit snugly in the drawer, without danger of pulling out accidentally. I plugged the charging unit into my phone and it worked perfectly, the drawer holding both phone and cord nicely and out of sight … Plus, as shown in the first picture, my iPad’s got a new charging home too, in the former phone book shelf … that’s it leaning jauntily. 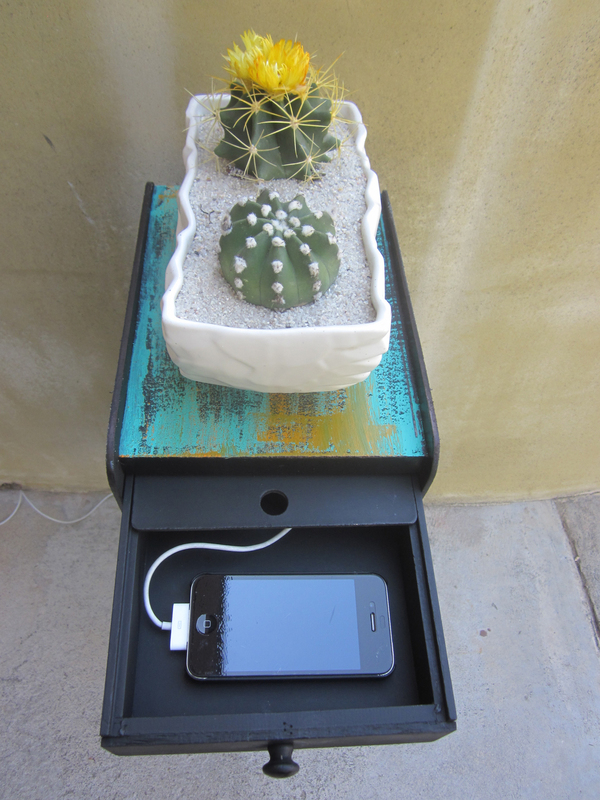 … or a pedestal for a sweet cactus couple … all the while charging my iPhone so I don’t miss a text message, tweet, blog post, step count or podcast. 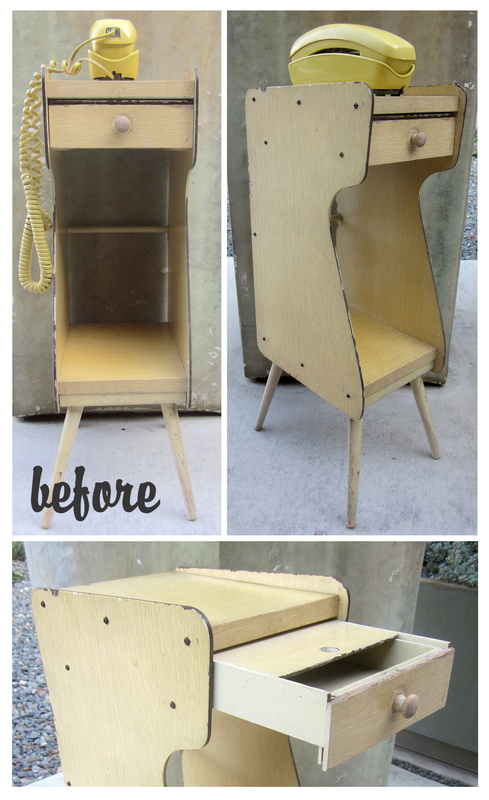 This little telephone table was transported from the 1960s to the 21st Century in an afternoon and the cost for materials was less than $25 for two cans of spray paint (I had the table, acrylic paints, tape, brushes and power drill already). 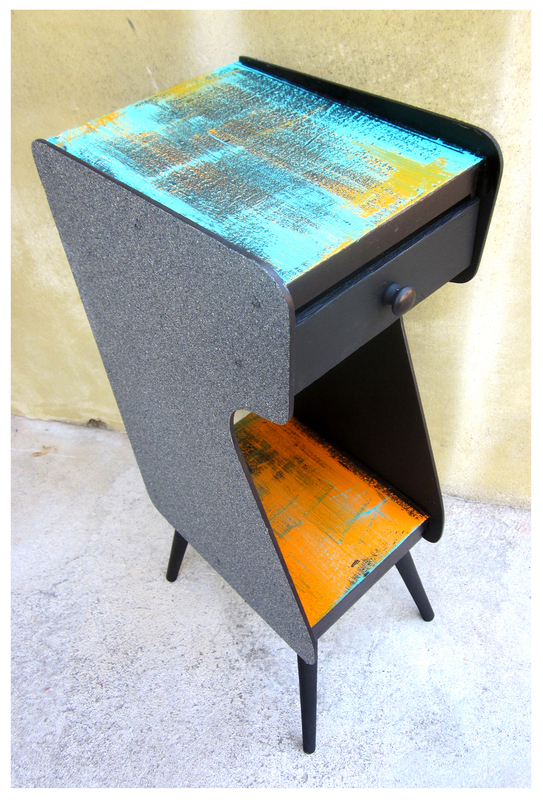 I’m gonna be on the lookout for other telephone tables for future projects. 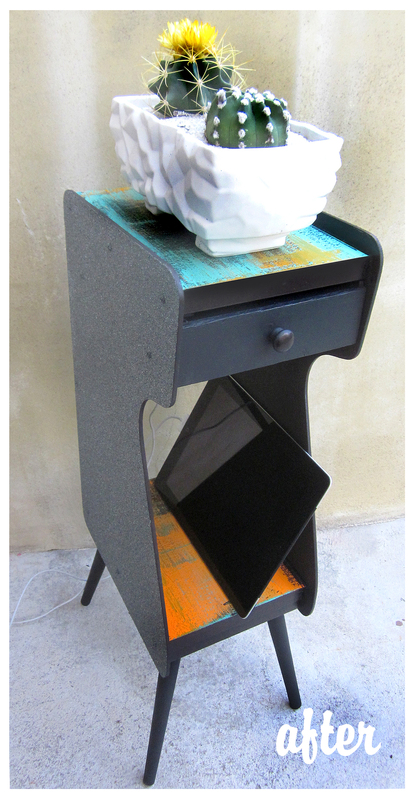 Some of them are really quirky with attached seats and other accoutrements; anyone need a smart phone charging station? VERY cool! Love the way it turned out. 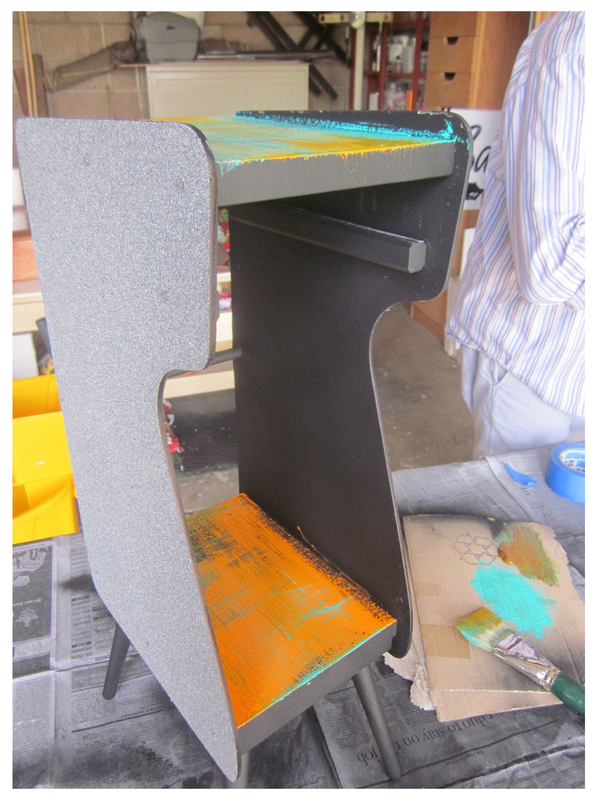 And that turquoise paint on top contrasts sooooo well with the black! Thanks very much! As with gardening, minimalism is a challenge for me … I gotta have color! Before I need a smartphone charging station I need a smartphone! I love this thing. Never have I seen the textured stone spray paint look so good. Thanks, MM, I was nervous about using it but it worked out! Hey, Vickie, I was just nervous that I might not like the pebbly surface when it was finished … I’d never used the product before and spray paint’s always scary: I always over-spray and then it gets drippy! Love the acrylics–they absolutely make the table. The cactus in the white dish is the right set decoration as well. Thanks, it’s nice to have one’s choices validated! You see… this is what I’m talking about, you’re so good… you can do anything! I love it and once again you have inspried me. I think a great lesson here is DON’T THROW ANYTHING AWAY, you never know what it may become. So many inspired ideas, sets my head awhirl. Fab. Thanks.